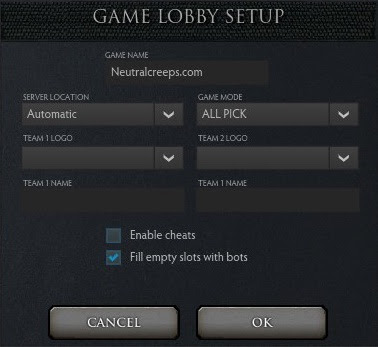 This guide will teach you how to add bots in Dota 2. The DotA AI versions were instrumental in teaching new players about DotA. Valve Corporation has taken note of that contribution and have added smart bots to play against in Dota 2. 1) Create a game lobby. 2) In the Game Lobby Setup, check the "Fill empty slots with Bots" option. 3) You have created bots in Dota 2. Start playing! If you have any questions about how to create bots in Dota 2, just post a comment below. Guys,how i create a lobby to play me against 1 bot? i DONT WANT ALL THESE BOTS!